The bailout failed the first time it was brought to the House. Undaunted, the Senate pressed on by attaching the bailout as an amendment to another House passed bill that was pending in the Senate. The new bailout version had new taxes, so according to the Constitution it should not have originated in the Senate. The rallying cry heard all over the Hill the past two weeks was that Congress must act. Our economy is facing a meltdown. Would this bill fix it? Nobody could really explain how it would. In fact, few demonstrated any real understanding of credit markets, of derivatives, of credit default swaps or mortgage-backed securities. If they did, they would have known better than to vote for this bill. All they knew was that this administration was saying some frightening things, and asking for a lot of money. And when has Congress ever been able to come up with a better solution to a problem than to throw more of your money at it? So that is what Congress did, enacting a financial PATRIOT Act in the process. In its embarrassment at being called a “Do-Nothing Congress” the 110th Congress took decisive action and did SOMETHING. No matter that it was the wrong thing. In fact, it wasn’t until the Senate had a chance to load it up with even MORE spending, when it was finally inflationary and horrible enough, at $850 billion instead of a mere $700 billion, that it passed – and with a comfortable margin, in spite of constituent calls still coming in overwhelmingly against it. 57 members switched their vote! The market went down anyway. Our nation is now just that much more in the hole. You will pay your part of this mess through inflation, and very likely hyperinflation. Sometimes doing nothing is much better than thrashing about aimlessly. When one is caught in quicksand, for example, or when one doesn’t understand economics and finds oneself in the position Congress was in for the past two weeks, with decades of irresponsible monetary policy coming to a head. Why should we trust the same people who said just a few months ago that the economy was perfectly sound? The same people who just knew there were weapons of mass destruction? The same people that crammed the PATRIOT Act down our throats? Why not consult the people who had the foresight and understanding to see this coming? They would have recommended such logical actions as repealing the Community Reinvestment Act, which forces banks to make bad loans, or allowing the market to set interest rates instead of the Federal Reserve system. How about abolishing the Federal Reserve altogether? There are many things that could have been done, but don’t expect Congress take a course of action that comes from a place of understanding and competence when they could just spend money. This bailout will be the legacy of the 110th “Do-Something” Congress, along with record low approval ratings. Here’s hoping the 111th Congress will be a “Do the Right Thing” Congress, and will focus on repealing and abolishing what is wrong with government instead of reinforcing it. Be one of 100,000 members to join by September 2nd. In between school assignments and work I have been reading Ron Paul’s latest book, The Revolution; A Manifesto. The reviews have been excellent – there are 635 reviews that you can peruse on Amazon.com – and used books can be purchased if you want to save a dollar or two. 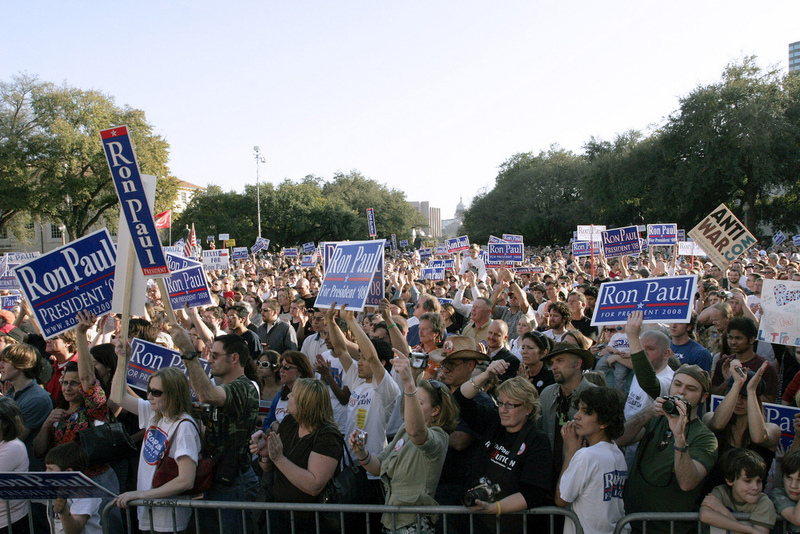 The information that Ron Paul writes about in this article is as valid today as it was in 2006. Construction on the NAFTA superhighway continues, especially in Texas, but there is not one iota of information in mainstream media about it or the protests against it or the fights to stop it. I’ve talked with people who do not even know that this is an issue or that it even exists. Very sad… We need to keep talking to people about these issues and making them aware. We need to help people to wake up! This superhighway would connect Mexico, the United States, and Canada, cutting a wide swath through the middle of Texas and up through Kansas City. This will require coordinated federal and state eminent domain actions on an unprecedented scale, as literally millions of people and businesses could be displaced. The loss of whole communities is almost certain, as planners cannot wind the highway around every quaint town, historic building, or senior citizen apartment for thousands of miles. One principal player is a Spanish construction company, which plans to build the highway and operate it as a toll road. But don’t be fooled: the superhighway proposal is not the result of free market demand, but rather an extension of government-managed trade schemes like NAFTA that benefit politically-connected interests. Governor Perry is a supporter of the superhighway project, and Congress has provided small amounts of money to study the proposal. Since this money was just one item in an enormous transportation appropriations bill, however, most members of Congress were not aware of it. The proposed highway is part of a broader plan advanced by a quasi-government organization called the “Security and Prosperity Partnership of North America,” or SPP. The SPP was first launched in 2005 by the heads of state of Canada, Mexico, and the United States at a summit in Waco. The real issue is national sovereignty. Once again, decisions that affect millions of Americans are not being made by those Americans themselves, or even by their elected representatives in Congress. Instead, a handful of elites use their government connections to bypass national legislatures and ignore our Constitution– which expressly grants Congress the sole authority to regulate international trade. The ultimate goal is not simply a superhighway, but an integrated North American Union–complete with a currency, a cross-national bureaucracy, and virtually borderless travel within the Union. Like the European Union, a North American Union would represent another step toward the abolition of national sovereignty altogether. Any movement toward a North American Union diminishes the ability of average Americans to influence the laws under which they must live. The SPP agreement, including the plan for a major transnational superhighway through Texas, is moving forward without congressional oversight– and that is an outrage. The administration needs a strong message from Congress that the American people will not tolerate backroom deals that threaten our sovereignty. March to War in Lebanon? Madam Speaker I rise in opposition to H. Res. 1194 because it is dangerously interventionist and will likely lead to more rather than less violence in the Middle East. I have noticed that this legislation reads eerily similar to a key clause in the 2002 Iraq war bill, H J Res 114, which authorized the use of force. I am concerned that this kind of similarity is intentional and will inevitably result in US military action in Lebanon , or against Syria or Iran . I am also concerned over the process of bringing this resolution to the Floor for a vote. I find it outrageous that H. Res. 1194, which calls for more risky US interventionism in the Middle East , is judged sufficiently “non-controversial” to be placed on the suspension calendar for consideration on the House Floor outside of normal order. Have we reached the point where it is no longer controversial to urge the president to use “all appropriate actions” — with the unmistakable implication that force may be used — to intervene in the domestic affairs of a foreign country? Mr. Speaker, the Arab League has been mediating the conflict between rival political factions in Lebanon and has had some success in halting the recent violence. Currently, negotiations are taking place in Qatar between the Lebanese factions and some slow but encouraging progress is being made. Regional actors – who do have an interest in the conflict – have stepped up in attempt to diffuse the crisis and reach a peaceful solution, and press reports today suggest that a deal between the rival factions may have been reached. Yet at this delicate stage of negotiations the US House is preparing to pass a very confrontational resolution pledging strong support for one side and condemning competing factions. US threats in this resolution to use “all appropriate actions” to support one faction are in fact a strong disincentive for factions to continue peaceful negotiations and could undermine the successes thus far under Arab League moderation. This legislation strongly condemns Iranian and Syrian support to one faction in Lebanon while pledging to involve the United States on the other side. Wouldn’t it be better to be involved on neither side and instead encourage the negotiations that have already begun to resolve the conflict? Afghanistan continues to sink toward chaos with no end in sight. The war in Iraq, launched on lies and deceptions, has cost nearly a trillion dollars and more than 4,000 lives with no end in sight. Saber rattling toward Iran and Syria increases daily, including this very legislation. Yet we are committing ourselves to intervene in a domestic political dispute that has nothing to do with the United States. This resolution leads us closer to a wider war in the Middle East . It involves the United States unnecessarily in an internal conflict between competing Lebanese political factions and will increase rather than decrease the chance for an increase in violence. The Lebanese should work out political disputes on their own or with the assistance of regional organizations like the Arab League. I urge my colleagues to reject this march to war and to reject H. Res. 1194. There has been a lot of talk in the news recently about the Federal Reserve and the actions it has taken over the past few months. Many media pundits have been bending over backwards to praise the Fed for supposedly restoring stability to the market. This interpretation of the Fed’s actions couldn’t be further from the truth. The current market crisis began because of Federal Reserve monetary policy during the early 2000s in which the Fed lowered the interest rate to a below-market rate. The artificially low rates led to overinvestment in housing and other malinvestments. When the first indications of market trouble began back in August of 2007, instead of holding back and allowing bad decision-makers to suffer the consequences of their actions, the Federal Reserve took aggressive, inflationary action to ensure that large Wall Street firms would not lose money. It began by lowering the discount rates, the rates of interest charged to banks who borrow directly from the Fed, and lengthening the terms of such loans. This eliminated much of the stigma from discount window borrowing and enabled troubled banks to come to the Fed directly for funding, pay only a slightly higher interest rate but also secure these loans for a period longer than just overnight. After the massive increase in discount window lending proved to be ineffective, the Fed became more and more creative with its funding arrangements. It has since created the Term Auction Facility (TAF), the Primary Dealer Credit Facility (PDCF), and the Term Securities Lending Facility (TSLF). The upshot of all of these new programs is that through auctions of securities or through deposits of collateral, the Fed is pushing hundreds of billions of dollars of funding into the financial system in a misguided attempt to shore up the stability of the system. The PDCF in particular is a departure from the established pattern of Fed intervention because it targets the primary dealers, the largest investment banks who purchase government securities directly from the New York Fed. These banks have never before been allowed to borrow from the Fed, but thanks to the Fed Board of Governors, these investment banks can now receive loans from the Fed in exchange for securities which will in all likelihood soon lose much of their value. The net effect of all this new funding has been to pump hundreds of billions of dollars into the financial system and bail out banks whose poor decision making should have caused them to go out of business. Instead of being forced to learn their lesson, these poor-performing banks are being rewarded for their financial mismanagement, and the ultimate cost of this bailout will fall on the American taxpayers. Already this new money flowing into the system is spurring talk of the next speculative bubble, possibly this time in commodities. Worst of all, the Treasury Department has recently proposed that the Federal Reserve, which was responsible for the housing bubble and subprime crisis in the first place, be rewarded for all its intervention by being turned into a super-regulator. The Treasury foresees the Fed as the guarantor of market stability, with oversight over any financial institution that could pose a threat to the financial system. Rewarding poor performing financial institutions is bad enough, but rewarding the institution that enabled the current economic crisis is unconscionable.